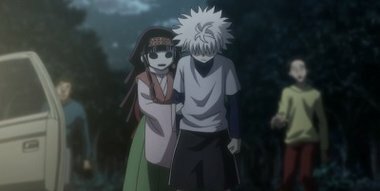 The election proceeds without a winner determined yet, and Killua is cornered by Illumi, who demands him to reveal which secrets he is hiding regarding Alluka's powers. Meanwhile, Hisoka keeps murdering other hunters just to amuse himself. Hisoka toujours aussi génial , et le groupe seirin sont une catastrophe hahaha. Le mec a la casquette en mode Jotaro s'est fait ken hors screen tellementle combat valait pas la peine contre Hisoka. Hate de voir la suite !